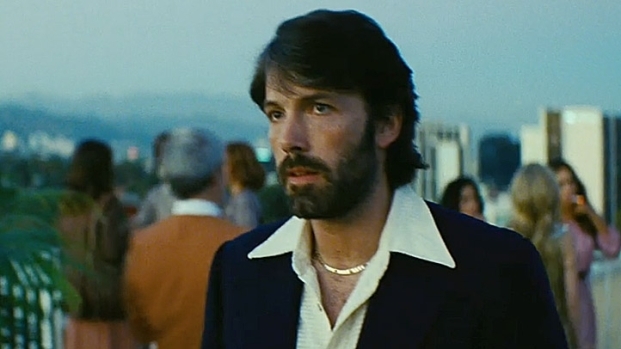 Ben Affleck goes back to the '70s in the spy thriller "Argo." "Argo" was the name of a film that was supposedly being shot by a group of Canadians in Tehran at the time of the Iranian Revolution in the late '70s. In reality, it was an undercover operation launched by the CIA to smuggle a half-dozen Americans out of the country. More than 30 years later, "Argo" is now a real movie about their daring rescue. Ben Affleck directed and stars in "Argo," as Tony Mendez, who was with the CIA for more than 20 years, serving a stint as the agency's master of disguise--his actual title. We were lucky enough to meet Mendez and his wife Jonna, another Agency veteran who served as master of disguise, in 2010, when we took then to see the Angelina Jolie spy thriller "Salt." They were impressed by her disguises, the film less so. You can watch out interview with them below. Anyway, we're digging the "Argo" trailer, which captures the look of the era without feeling schticky, has a vibe reminiscent of a heist film (which it kinda is) and a great cast that includes Bryan Cranston, Alan Arkin, John Goodman, Kyle Chandler, Victor Garber, Zeljko Ivanek, Richard Kind, Scoot McNairy and Taylor Schilling. Ben Affleck directed and stars in this film based on the true story of a CIA agent who smuggles six Americans out of Tehran during the Iranian Revolution by pretending they're part of a Canadian film crew making a sci-fi movie. Opens Oct. 12.